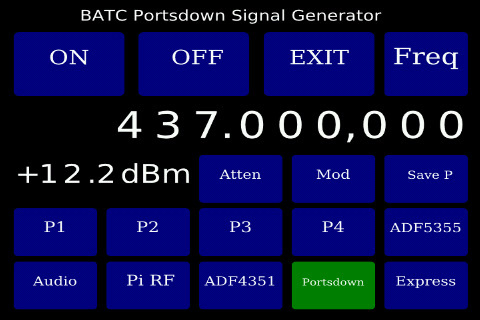 Software release 201801061 develops the capability to use the Portsdown as a capable signal generator covering 35 MHz to 4.2 GHz. 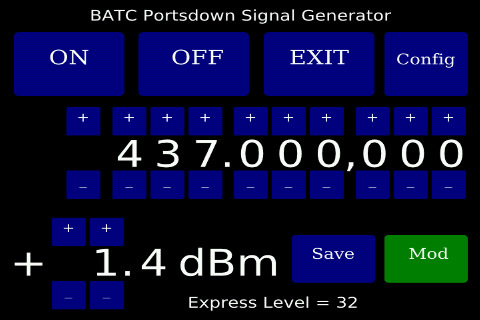 The Portsdown Signal Generator is accessed from Menu 3 of the Portsdown Transmitter touchscreen. When the "Sig Gen" is started it stops the Portsdown Transmitter application, and starts the signal generator. On exit from the signal generator the Portsdown Transmitter is restarted (in a standby state) on Menu 1. The Signal Generator is only controlled from the touchscreen and cannot be controlled from the console. The signal generator starts with the last saved configuration (as saved from the Frequency Screen) and with the output and modulation off. The Configuration Screen is shown at startup. The Portsdown can be set to boot directly into the Signal Generator and turn the output on (using the saved settings). This capability can be enabled from the Setup, Autostart menu on the console. The Signal Generator has 2 screens, a Configuration Screen and a Frequency Screen. The ON button enables the RF output. The OFF button stops the RF output. The EXIT button terminates the Signal Generator and restarts the Portsdown DATV Transmitter. The Freq Button switches to the second screen (see below). The next line shows the demanded frequency, and the following line the approximate output level. The attenuator button is used to allow for the use of an external software-controlled attenuator of the PE43703, PE43713, PE4302, PE4312 or HMC1119 type available from eBay. If the button is Blue, no Attenuator is assumed to be used. If the button is green, the software assumes that an attenuator is in-circuit. The attenuation provided is controlled (set) by the demanded output level on the "Freq" screen. Full details can be found on this page Output Attenuator. The specific type of attenuator is set from the setup menu of the console. Whilst in use, the setting of the attenuator is displayed on the Frequency page. Selecting the "Mod" button applies 333KS QPSK DVB-S modulation with an H264-coded image to the Portsdown output or the DATV Express output. It is inoperative in other modes. The estimated power level is adjusted to take account of the effects of the modulation. The Save P button sets up the software to save the current configuration in one of the 4 presets (P1 - P4) on the next line. On pressing Save P, the button is highlighted until one of the presets is pressed; then the preset is over-written with the current configuration and the highlight is removed. Pressing any of the preset buttons simply recalls the appropriate stored preset. This output is not implemented yet, but the intention is that the signal generator will be able to control an external ADF5355 VCO (as available on eBay) to generate signals at up to 13.6 GHz. The ADF5355 reference frequency is stored in the siggenconfig.txt file and may need to be manually edited. This output is not implemented yet, but the intention is that the signal generator will be able to output an audio sine wave at the selected frequency. This output is not implemented yet, but the intention is that the Raspberry Pi will be able to generate a signal below 35 MHz on a GPIO pin in a similar manner to the QPSKRF (ugly) DATV mode. This capability will use F5OEO's RPiTX software. This is implemented, and uses the ADF4351's second output to provide a CW signal in the range 35 MHz to 4.29 GHz. The upper limit is currently 4.29 GHz because of limitations in the 3rd party software driver used by the ADF4351 (which can reach 4.4 GHz). The level is typically between -8 dBM and +4 dBm and is adjustable in 4 steps of approx 3 dB. The exact output level varies (plus or minus 2 dB or so) depending on the termination of the other ADF4351 output port. The displayed output level is unable to take account of this variation. If the attenuator is connected to the ADF4351 output, and then selected on the menu, the output level can be adjusted over a range of 31dB. Note that, below 2.2GHz, the output of the ADF4351 is a square wave and so will have a high 3rd harmonic content. If the filter modulator board is still powered up, it will still output on the ADF4351's frequency at a higher level. In some cases, when being driven by signals over 2 GHz at the highest ADF4351 output level, the filter-modulator board will oscillate in the 750 MHz region. The frequency displayed on the touchscreen is the "demanded frequency". Due to limitations in the Analog Devices software driver being used, the generated frequency will step at intervals of about 1/500,000th of the selected frequency. For example, the step at 1240 MHz is about 3KHz. This is also implemented, and currently controls the output of the Portsdown Filter-Modulator board to provide a non-adjustable output level of up to 15 dBm between 50 and 1500 MHz. Note that this output has a reasonably high 2nd and 3rd harmonic content. The selectable frequency is limited to the range 50 - 1500 MHz because the output level is unpredictable outside this frequency range. This output is at a higher level (though over a more limited frequency range) than the direct CW output from the ADF4351. With the switchable attenuator and modulation options, this output is also intended to be used to adjust the Portsdown transmitter to the correct level for driving a PA without distortion. The modulation is 333KS, allowing the transmitted spectrum to be viewed on an RTL-SDR and PC for adjustment. Whilst selected without modulation, this output sets the band switching of the Portsdown so that the VCO filter is switched out of circuit and (if an RF output switch is in use) the output is switched to the 1255 MHz output socket. Additionally, the IQ filter is set to 333 KS and the I and Q lines are set to 0v. The VCO level is always set to maximum to maximise the final output level. The displayed output level is calibrated for a typical Portsdown filter-modulator board without the RF output switch board in-circuit. The RF output switching board induces losses of about 1.2 dB at 50 MHz, 1.6 db at 146 MHz, 1.9 dB at 437 MHz and 3.0 dB at 1255 MHz. When selected with modulation, the Portsdown output is modulated at 333KS with the appropriate settings (including output switching) for the selected frequency. The ADF4351 reference frequency used for the Portsdown and ADF4351 outputs is taken from the configuration file used for the Portsdown ATV Transmitter (rpidatvconfig.txt), so no new user setup is required. Software Version 201801061 introduced the capability to use the DATV Express board as a very capable signal generator covering 70 - 2450 MHz at levels from -30dBm to +17dBm. Additionally, the DATV Express can be used as a DVB-S test source for checking amplifier linearity. Selecting the "Mod" button applies 333KS QPSK DVB-S modulation with an H264-coded image. If the amplifier output is viewed on a spectrum analyser (or an RTL-SDR with a program such as SDR# on a PC or FreqShow on another Raspberry Pi), the level can then be adjusted appropriately to prevent too much spectral regrowth. The estimated DATV Express RF output level is displayed, together with the DATV Express attenuator level setting (on the frequency page). The top 4 buttons on the frequency screen have similar functions to those on the Configuration Screen. The second row shows the current selected frequency on Hz. Depending on the available frequency range of the selected output, blue buttons above and below each digit enable the frequency to be adjusted. This adjustment is limited to the valid frequency range for the selected output and any buttons that are not required are hidden. The small size of the buttons has highlighted some issues in registration between touchscreens and displays. Run the calibration utility on Menu 3 and you will be surprised at how much more responsive it makes the screen feel. The frequency displayed on the touchscreen is the "demanded frequency". Due to limitations in the Analog Devices software driver being used, the generated frequency in Portsdown and ADF4351 modes will step at intervals of about 1/500,000th of the selected frequency. For example, the step at 1240 MHz is about 3KHz. The third row shows the current estimated output level. The level is calculated from a calibration table which is pre-populated with the best available data. This table is located at in the file /home/pi/rpidatv/src/siggen/siggencal.txt and can be amended by users if they wish. Any amendments will be preserved during subsequent software upgrades. If the output level can be adjusted, blue buttons will appear above and below the digits. Note that the level steps will not be regular - pressing the button simply selects the next available output level in the direction requested. The Save button saves the current settings for use as the default configuration. It is this saved setting that will be used when the Signal Generator is next started, not the last setting used before shutdown. The Mod button has the same functionality as the Mod button on the Configuration Screen. This page was last modified on 8 September 2018, at 15:41.